Wholefood from the ground up distills Jude's wealth of knowledge into one incredible guide. In addition to more than 120 nourishing recipes there is clear information about what constitutes 'good' food, where to source it and how to use it to its best effect. 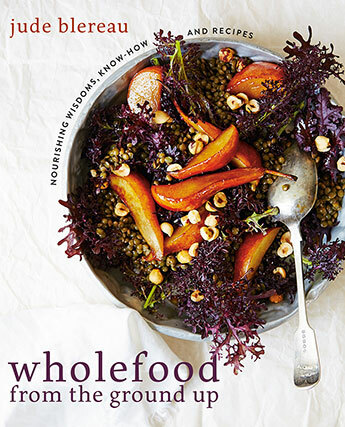 There is also a guide to building a wholefood pantry from scratch as well as practical tips for planning and preparing food ahead. Eat well, even on the busiest days. Jude Blereau was living a wholefood life long before 'wholefood' was a buzzword for healthy living and is the most authoritative, long established wholefood writer in Australia today. Jude has been actively involved in the organic and wholefood world for over 25 years. Her focus is on helping people learn about good food and giving them the tools and information they need to make healthy and wholesome eating a delicious part of their everyday lives. Jude has written five books with Murdoch: Wholefood, Coming Home to Eat, Wholefood for Children, Wholefood Baking and Wholefood From the Ground Up..